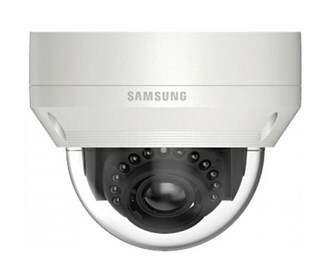 The Samsung B2B SCV-5083R is a analog vandal-resistant indoor and outdoor dome camera that provides 1000TV lines resolution. This camera is equipped with a 3.3x V/F lens and 16x digital zoom for precise monitoring. The adjustable focal legnth provides a flexible wide-to-narrow range of view that is especially useful for surveillance applications with evolving needs. It features SSDR (Samsung Super Dynamic Range) and SSNR IV (Super Noise Reduction IV) that balances the overall brightness by illuminating the darker areas to the same ratio as the bright areas, and produces clear images under high-contrast lighting conditions. When connected to a compatible DVR via a BNC cable, this camera offers motion and tamper detection, and 24-zone privacy masking as well as advanced image control settings, such as defog and purple fringing to produce clear, high-quality images. It comes with video analytics feature which includes the tracking, Fixed/Moved, Fence, Detection, Counting and Tampering. This results in efficient tracking of all movements within the area of detection of the camera unit. The Samsung B2B SCV-5083R has many exciting features for users of all types. See the Samsung B2B SCV-5083R gallery images above for more product views. The Samsung B2B SCV-5083R is sold as a Brand New Unopened Item.